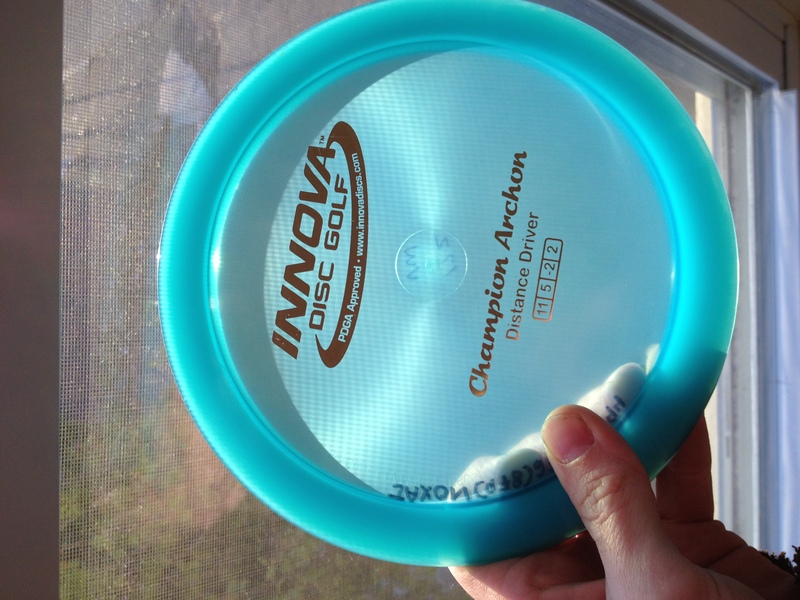 When you go looking for information on the new Innova Archon on Innova’s own website, you encounter very helpful lines like, “It has the finesse you need when the course throws you curves,” and also, “This is the disc for players looking to master their game and rule the course.” Thank you Innova. I am always looking for more ammunition to make fun of you with! These very insightful bits of information will surely be carried with me to my grave. That being said, and Innova bashing aside (it’s all just marketing and white noise anyway)- I really like this disc! If you read message boards for new disc information, you might already know that this is just another of Innova’s mix n’ match discs. 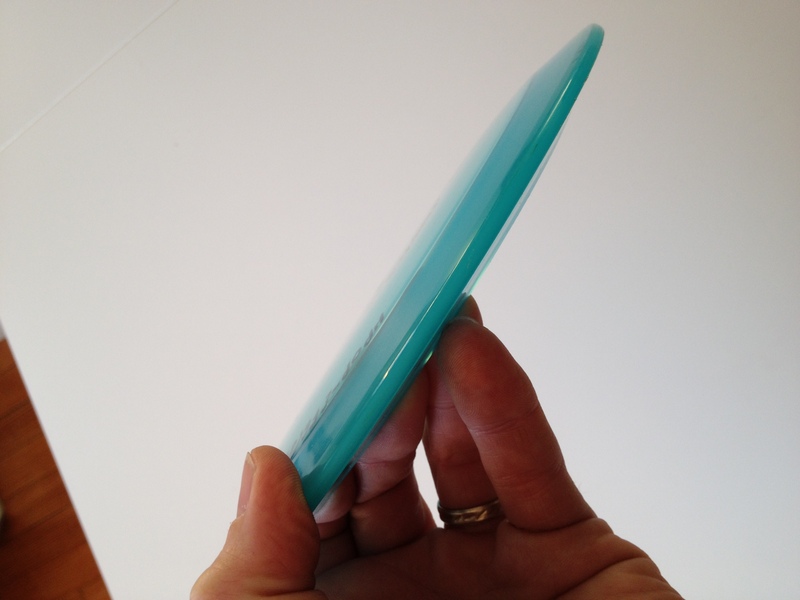 They took an existing top, and an existing bottom- and made a new disc. The Archon is a Vulcan top (understable distance driver) and a Wraith bottom (stable distance driver). Hence the “VW” written on the bottom of many models. You can probably sum up the Archon, in all seriousness, as a seasoned Wraith with reliable fade. This was the best part of the disc’s flight for me: the fade. I have medium arm speed. I’m no noodle arm, but I also don’t throw a Nuke OS or an Ape with any effectiveness. Speed 11 discs and I have always bonded quite well. If you’ve had luck with Wraiths, the Surge, or even a Valkyrie- you will be able to get the most out of an Archon. If you haven’t mastered throwing a Leopard anhyzer, or flipping over a Road Runner- then I wouldn’t bother picking up an Archon. On a full power drive for me, the Archon flies out fairly straight and works itself into a distance inducing S curve. Where I normally throw 300 feet, the Archon goes about 330. I don’t really tout distance as a super important factor- so the added distance with the Archon for me is just a bonus. Of course I want max distance, but it’s way less important than accuracy. I can remain accurate with this disc at max power. I can’t hit a bullseye on the horizon, but since the disc is the perfect blend of being slightly flippy, but a speed 11 at the same time- it gives me the confidence to really get into the drive knowing that it won’t “turn and burn” but also won’t hyzer out due to a weak throw. It adds consistency to my drive, even though it’s S curve may be a variable. I tried a Star plastic version of the Archon for a brief period, but since I had traded for it, I ended up with a max weight 175g disc. I don’t like max weight discs generally (unless it’s a putter) and I also don’t like Star plastic in the winter (way too stiff). So I traded it away soon after trying it and I picked up a brand new Champion Archon at 170g. It’s not too domey and has enough gumminess for my taste. Right out of the box this thing is giving me an S curve, and has held up well so far. I appreciate finding an Innova disc that flies well out of the box (something Discraft is known better for across the board) without having to break it in. When this driver starts diving to the ground and I can no longer hyzer-flip it back into legitimacy- I will just buy another one. I recently lost one of my Wraiths, and my remaining Wraith is the seasoned, flippy one. This Archon is quickly replacing my seasoned Wraith because it has the same turn, but a better fade which adds more distance. I was initially turned off from this disc because of the cheesy description (Innova should be more careful when they think of these write-ups). It seemed like a beginner’s disc, and I didn’t think it had a place in my bag. I took a trip to Florida this February however, bringing all back-up discs, and it made a great impression in just 5 rounds of disc golf. I’m now hooked on this thing, and I would recommend it to anyone. It gives you the S curves of your dreams, so dream a little dream of Innova you guys. Master the course and rule the world with the Archon; the most graceful disc to finesse the market since 2011 AD. This entry was posted in Equipment and Gear and tagged archon, champion, disc, golf, innova, review. Bookmark the permalink. great review. I was very pleased when I read this because the reason i went shopping for a disc because my very faithful, friendly wraith has been dive bombing on me and I needed to get another one. Unfortunately the wraith is not typically sold in retail stores, but I was able to pick up a champion Archon noticing that it seemed to be very similiar to the wraith in specs and it speed. Thanks! going try it out now. I am very happy i stumbled upon this review. I went and played a long, open course but i kept rolling my champion Valkyrie over. Therefore I needed a higher speed of a Valkyrie, and because of this review I have made my decision on a new disc.